I know it's been a while since I last posted, but like everyone else, I've been busy with the season! 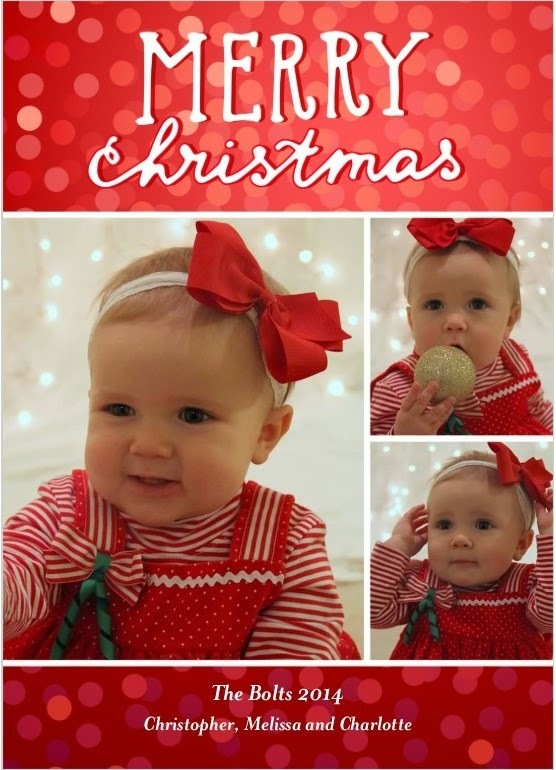 Since this is Charlotte's first Christmas, I find myself experiencing a lot of firsts as well! Standing in the toy aisle agonizing over the perfect gift for Charlotte, making sure she has Christmas jammies, a Christmas outfit (a dressy church one AND something she can spend the rest of the day in), and of course hunting down the ever so popular (and sold out nearly everywhere) "Twas The Night Before Christmas" book to read tonight. Let's also not forget the cookies and milk for Santa! I know I sound like a crazy person, but I don't get a do-over on Charlotte's first Christmas so I want to make sure we do it right. Sure, she won't remember this but I'm a believer in starting traditions day one. I want to be able to look back one day and show her pictures of all her Christmases and to see that even her first Christmas was magical. So from my family to yours, we wish you a Very Merry and Blessed Christmas!